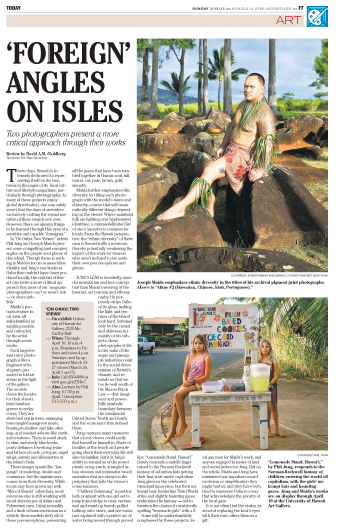 A review of my current exhibition with Joseph Maida "On O'ahu" in the Honolulu Star-Advertiser. Honolulu Star-Advertiser reviews Phil Jung’s O'ahu in On O’ahu: Two Views at the Art Gallery at the University of Hawaii, Mānoa, though April 10, 2015. In “On Oahu: Two Views,” artists Phil Jung and Joseph Maida present some compelling and complex angles on the people and places of this island. Though there is nothing in Maida’s focus on masculine identity and Jung’s raw looks at Oahu that couldn’t have been produced locally, the context of fine art can invite a more critical approach that most of our magazine photographers can’t or won’t risk — or share publicly. Maida’s portraits feature local men, all self-identified as aspiring models and contacted by the artist through social media. Each large-format color photograph is like a fragment of Instagram, promoted to full art status in the light of the gallery. The models chose the locales for their shoots, from bamboo groves to rocky coves. They are stretched out in trees, emerging from tangled mangrove roots, floating in shallow surf like offerings, and washed ashore like mythical creatures. There is sand stuck to skin, and steely blue looks, pouty defiance, low-slung jeans and tattoos of owls, octopus, angel wings, pistols and silhouettes of the island chain. These images speak the “language” of modeling, desire and commerce, but the significance comes from their diversity. While locals may have grown up with “Men of Hawaii” calendars, most everyone else is still working with racist stereotypes of Asian and Polynesian men. Using sexuality and a dash of homoeroticism as a vehicle, these models defy all of those preconceptions, presenting all the genes that have been tumbled together in Hawaii: waif, full, round, cut, pale, brown, gold, smooth. Maida further emphasizes this diversity by titling each photograph with the model’s name and ethnicity, a move that will mean radically different things depending on the viewer. Where mainland folk are fighting over hyphenated identities, a comma-delimited list of one’s ancestry is common for locals. From the Hawaii perspective, the “ethnic diversity” of these men is theoretically a nonissue, thereby potentially weakening the impact of the work for viewers who aren’t inclined to set aside their own preconceptions and givens. Jung’s lens is decidedly more documentarian and less conceptual than Maida’s weaving of the Internet, art tourism and ethnography. He purposely strips Oahu of its gloss, making the light and textures of the island look hard. Softened only by the casual and oblivious humanity of his subjects, these photographs of life in the wake of the sugar and pineapple industries point to the social determinism of Hawaii’s climate, and reminds us that we too lie well south of the Mason-Dixon Line — that imaginary and powerfully symbolic boundary between the continental United States’ North and South and the economics that defined them. Jung captures many moments that a local viewer could easily find herself or himself in. Shots of families at the beach and people going about their everyday life will also be familiar, but it is Jung’s ability to remind us of the power plants, scrap yards, strangled urban streams and minimalist beach amenities that are always in the periphery that jolts the viewer’s consciousness. "Children Swimming" is particularly poignant with one girl set to jump from bridge to river, various surf and stand-up boards pulled halfway onto shore, and one swimmer captured with a perfect arc of water being issued through pursed lips. "Lemonade Stand, Hawai‘i" barely conceals a middle finger raised to the Norman Rockwell fantasy of suburban kids getting their first start under capitalism. Jung gives us the celebrated blond-girl innocence, but their unkempt hair, borderline Third World attire and slightly haunting gazes undermine the fantasy — not to mention the charm of consistently spelling "lemonade girls" with a Z. Some will be understandably nonplussed by these projects: local gay men for Maida’s work, and anyone engaged in issues of land and social justice for Jung. But on the whole, Maida and Jung have minimized any impulses toward exoticism or simplification they might harbor, and they have both tried to represent Oahu in a way that acknowledges the priority of the local gaze. It is not often that the visitor, instead of replacing the host’s eyes with their own, offers them as a gift.